Shutters are available in a wide range of painted and stained finishes from Shutterly Fabulous. Our shutters are not sold via any other full service shutter company in the UK and our range of colours is unique to Shutterly Fabulous. We take the design of your shutters very seriously and our In House Consultant can help talk through with you the pro’s and con’s of using different colours within your room to make the most of your shutters. The study of this London home shows FSC certified poplar hard wood shutters, painted in Alabaster, a colour from our standard paint range. They are made with 89mm shutters slats and have rebated panels which mean the panels interlock to minimize the amount of light coming into the room, between the panels. The shutters shown are mounted inside the recess, tight in towards the window itself. Shutterly Fabulous will talk you through the different shutter mounting and installation options to you. Choosing which design works best is an important process for the Design Consultation as we want your shutters to work most effectively for you. In this instance, the shutters were rarely going to be opened. The panels would stay in place most of the time and the slats tilted. Therefore, mounting the shutters tight inside the recess made most sense as it left the window sill ‘within’ the room, as opposed to being ‘lost’ behind the shutters. If you have a similar window and want to open the panels on a regular basis, it’s better to have the shutters either with smaller panels (which will not protrude as much from the recess) or alternatively at the very front of the recess, flush with the internal wall. This way, the panels can fold back 180 degrees onto the side walls. 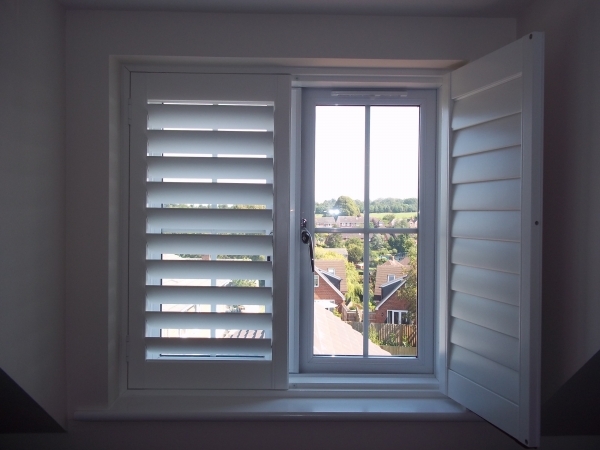 You plantation shutters design is something we take very seriously. Shutters are investments and it’s imperative you get the ideal design to work for your home, whether you live in London or any other part of the UK. To gain the benefit of our years of shutter experience, contact us to discuss your unique shutter requirements.